Nowadays, it seems to be rather common for developers to lose focus of what they set out to do when they start making a particular game. In an attempt to include "something for everyone" or to make the gameplay as diverse and interesting as possible, a game can often get bogged down by unnecessary distractions and additional content that just doesn't gel with the rest of the title. And then, every once in a while, you come across a game that obviously had a very clear vision from the start that was pursued with determination. 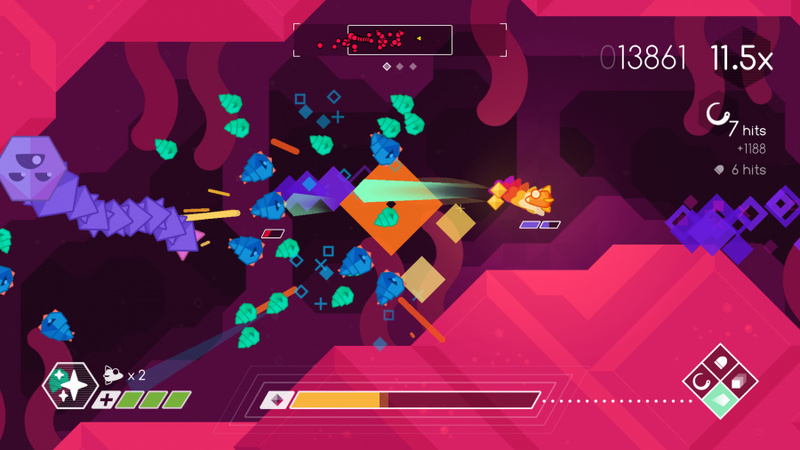 Enter Graceful Explosion Machine, a Switch-exclusive arcade shooter with a lot of style and a surprising amount of substance. 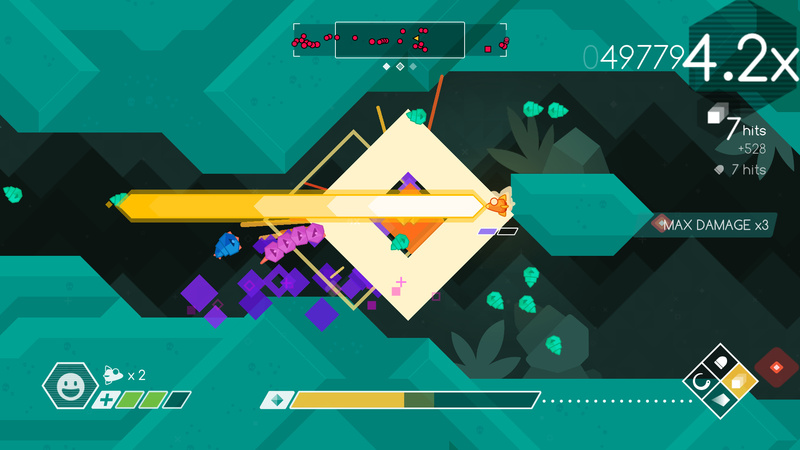 Graceful Explosion Machine is a game that knows exactly what it wants to be, and it delivers on that to nearly the highest degree. Gameplay is quite simple, nailing that sense of being easy to pick up and difficult to master. Levels are tackled in three phases - often with aspects of the environment changing between phases - and wrap around; flying far enough to the right will eventually pop you out on the left. Your ship has four weapons: a basic peashooter that can be fired continuously, but with the threat of overheating, and three more powerful weapons that rely on a shared energy bar that is refilled with pickups from felled enemies. These weapons each excel in their own particular way while also having glaring weaknesses that encourage usage of your full arsenal; for example the missiles are quite useful for crowd control, but they empty the energy gauge the fastest. It's a system that works remarkably well, as the game quickly becomes an exercise in resource management in addition to a test of the raw reflexes required to successfully navigate hordes of enemies. Once you get into the thick of things, gameplay takes on the feeling of something that's rather like a cross of Bayonetta and an arcade shooter. Upon completing a level you're given a grade based on how efficiently and stylishly you blasted through your enemies, and the highest ranks are tied to maintaining a high score multiplier and using all your weapons to the best of your ability. If you get damaged or go too long without shooting something the multiplier resets to one; this encourages aggressive and diverse tactics as you progress. Moreover, you're awarded more points if you frequently switch between weapons, and receive bonuses for using them to the full extent of their capabilities, such as getting "Missile Heaven" for unloading nearly a full energy gauge of missiles on a legion of enemies. What's immediately gripping about all of this is how continuously dynamic the experience feels. Even though there are only a handful of enemy types and level designs are difficult to distinguish from each other, no two games are quite the same as the chaotic and fast paced nature of combat takes hold. There's no progression to speak of here — all weapons and abilities are handed to you up front — but it's the natural experience that you acquire over repeated play that'll keep you coming back and hook you in over the long run. For example, it becomes incredibly satisfying to go back to previous levels for a higher score once you've gotten a handle on the nuances of spacing and timing of attacks. Also, after beating a world, you unlock challenge mode levels for it, which entail a juiced up version of the world's final level and a brutal one shot run of the whole world to see how high you can pump up a continuous score. 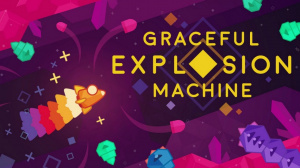 Clearly, the main draw of Graceful Explosion Machine is not found in simply beating the game, that's only the beginning, it's found in repeated attempts at beating previous records and attaining higher ranks. And if self-motivation isn't enough, there are also leaderboards with a range of filtering options to keep you supplied with more short term goals. The presentation is another highlight of the experience, nailing the look of being both simple and sophisticated. The visuals of this game can be characterized by plenty of geometric shapes, boldly defined lines, and rich monochromatic worlds. This all works to support the gameplay structure in a pleasing way; the minimalist visuals make it easy to track the chaos happening on screen, and it looks quite pretty in motion. This is further supported by the HD Rumble, which vibrates differently depending upon what wepon is being used and what kind of enemy is being blown up. It's subtle to be sure, but that's arguably what the effect is intended to be, a natural extension of the experience that adds that extra immersion factor. The sound design is well executed, though a bit forgettable. The various bleeps and bloops that you hear as you multipliers skyrocket and missiles are sent flying fit the experience perfectly, but the soundtrack leaves a bit to be desired. It feels like there could've been a bit more done on this front, as the music tends to be a bit one-note and repetitive. Still, it doesn't do anything to detract from the game as a whole, and you'll be far too focused on the action on screen to really notice anyway. 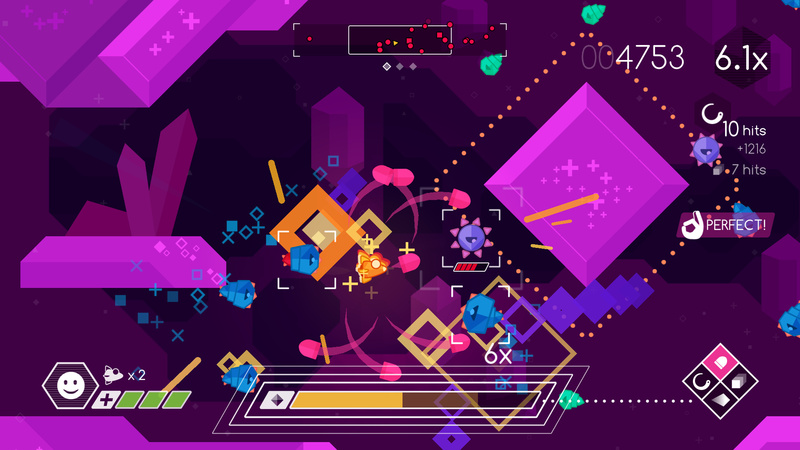 If we were to name one complaint with Graceful Explosion Machine, it would be that it's a game which tends to show its hand quite early. Though there are four distinct worlds, they mostly function as palette swaps of each other, with only the colour theme and maybe an enemy or two differentiating them from each other. This extends to the enemy variety as well; it seems like you see the same few enemies all too often. Now, the inherent nature of an arcade shooter certainly does minimize the impact of this — after all, the "arcade" element would be dialed down quite a bit if it threw something new at you every other level — but there's a lingering sense of sameness to the whole experience. Make no mistake, this is a game that you won't want to be buying for the breadth of its content, but for the depth of its content. It'll take you many hours to truly master each level, but if you're just looking to just blitz through the main story and call it a day, the value drops. 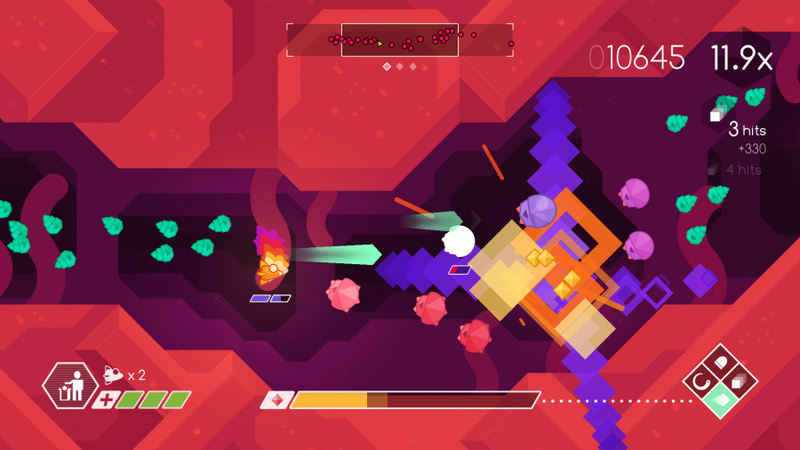 Overall, Graceful Explosion Machine is a masterful example of how to do an arcade shooter right. Eye-catching visuals and extremely fine-tuned gameplay combine to make this a memorable and compelling experience for anybody looking to get into a faster paced, action focused game. That being said, there is a minor element of repetitiveness which never goes away entirely; the selling point comes not from the amount of levels, but from how many times you'll be playing each one. We give Graceful Explosion Machine a very strong recommendation, all told; considering the amount of polish and replayability on offer, this is quite the bang for your buck. Sold! Will be picking it up at lunch break. Going back and reading the review now looks like a pure fun game, and I like that. Is there any local co-op mode or just some other multiplayer goodness ahead of the leaderboards? I'm pleasantly surprised by that score. I thought it was a mess of blocky vibrant colours. Will have to check out more videos on it. Reading the review, I didn't expect to see a 9/10 at the end! That definitely escalates it from "title I would have completely ignored" to "title that's made it on to my interested list". Thanks for the review. Isn't this a timed exclusive rather than a complete Switch exclusive? Sounded good until you mentioned Bayonetta. Meh, it's still a shmup so I'll give it a shot. I suppose you shouldn't judge a book by its cover (or a game by its visuals), as I thought this had 7/10 written all over it. I'm still not sold on it yet. I'll watch some gameplay and reviews on YouTube to see if it's my kinda thing. Thanks for the review though. Wow, the 9 is turning heads. There is much to be excited about on the Switch eshop. It's filling the void in comparison to retail and vc. I would want to try this before purchasing as I don't immediately get the appeal. Well, I love a good shmup. Will probably pick this up eventually. Oh wow a 9.im am interested now. Blimey, didn't see that coming! Being a shmup fan I shall have to invest. @SpaceEquilibrium You are correct. They should definitely fix that. My interest in this title has been fickle at best. But I guess I might as well pick it up. I don't have anything else to play on my Switch until Disgaea 5 and £10 really isn't a big deal. I really like the look of this game, but personally I feel life's too short for high score chasing, so I don't think I'd get a lot of value from it. Woah! Didn't expect that. I may have to get this now. Exclusive as well so worth supporting. I've been keeping my eye on this game. I bought Geometry Wars: Galaxies for DS few years ago for 3€ and loved it. 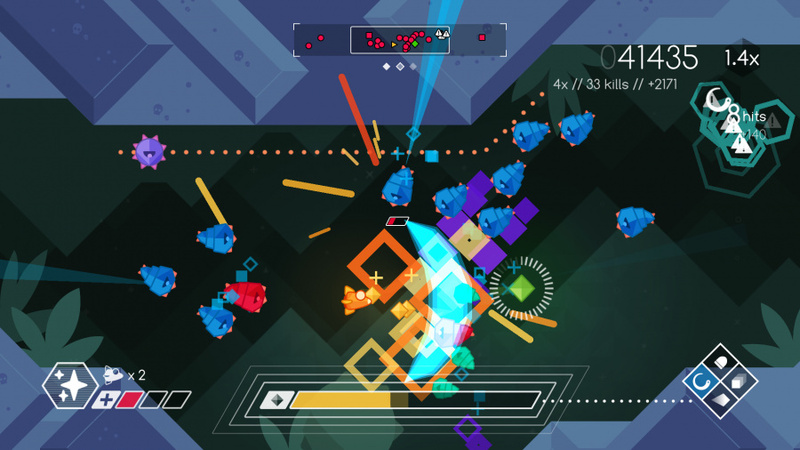 This game looks a lot like Geometry Wars. I'm sure to pick it up. I've been waiting all week on this game great to see it got an awesome review now I just can't wait too get done at work and go play . It looks gorgeous, it sounds marvelous. But the repetitive gameplay worries me. I want to have a new original game on my Switch but as it stands now, I might be getting Isaac or Shovel Knight instead. Argh, too many great games on Switch with too little time/resources to engage with them all, haha. It's a good problem to have, I suppose. I will buy it soon. This month is wonderful for switch's owners. Wonder Boy, Graceful Explosion Machine, Mr Shifty and Mario Kart 8 Deluxe! SOLD! This and ASO II this week! PEW PEW!! This is a fun game. I've already played the first level about 7 times trying to beat my score. I'm coming fifth. I'm finding the hd rumble adds a lot to games because of it's sharper sort of feel, it's very effective, especially in handheld where the whole unit vibrates. I also bought this so I would have thirteen games and would get the 'show all software' button. Haha. Been playing this for the last hour and it's a really enjoyable pick up and play game. Great for short bursts and high score chasing. Let the kids (Fifa and COD fans- sorry) play it and they loved it. The icing on the cake would be two player with a joy con each but even as a one player it's well worth the price of admission. On initial play, it has hooked me more than snake pass. Hope this helps for anyone still undecided. @Late It's not like Geomatry wars at all unfortunately- if that's what you were after. Much more like Defender and Fantasy Zone mashed up. @lemonjellydude If you like games like Defender and Robotron you will love it. If not then probably not. Any word of a demo? Arcade games are all about feel, which is a rather individual thing, and I'd like to see how I get on with it. @darthstuey I noticed it's somewhat different but I still get some GW vibes. Maybe it's just the simplistic and colorful style. It looks cool regardless. It's good, but I'm already getting sick of seeing the same 2 enemies too often, so 9 seems a little too generous. Ooh, I was looking forward to this one since the indie Direct, but I had no idea it would score this highly! Gonna grab it right away along with ASO II. I'm actually having a bit of trouble keeping up with all these games even though Switch supposedly only has Zelda to play and nothing else according to the haters. And in a couple of weeks we'll have Puyo Puyo Tetris and Mario Kart. I wonder when we'll get a date for Enter the Gungeon as that's another brilliant release waiting in the wings. Also interested in the game. I like the visuals and going by the trailer the music too. But im not sure about the gameplay. Waiting for demo or price cut. This is really good fun . My Switch backlog grows. @Jhena: I love your avatar! Tekonkinkreet is one of my favorite movies and one of the best anime films of all time!! I haven't thought about it in a long time so I was quite surprised to see it here! Definitely overdo for a research! And on topic, I think I'll pick this game up! @Gen0neD If the Bayo-ness comes from being rewarded for being "stylish" rather than just being able to kill things efficiently and not getting hit (which, to be fair, are also judging criteria), there's a possibility that the game may seem to look down upon you simply for choosing one method of survival and enemy disposal over another. Just to use the "missile heaven" example, being rewarded for emptying the weapons gauge on a bunch of enemies may be unnecessary given that said enemies need to die anyway. Simply put, using weapons to the fullest extent of their abilities should be rewarding enough on its own, and not need to be bolstered by bonuses that could end up just making the game seem to look down upon you if you chose some "less stylish" way to quickly dispose of your enemies. Bought it--love shooters like most of you love air--but a 9 is waaaaay over-the-top (if this is a 9, what are some of Raizing's games? 27 out of 10?). I think this is good but I am finding it pretty repetitive, not sure how much time I will sink into this. Not a shooter fan but took a chance. This review is spot on. Can seem repetitive but it's the allure of mastering the game that keeps me coming back. I can see me playing this as a substitute when I don't have time for a Zelda-esque adventure. Instantly liked this from the first trailer, glad its got a good review. OK - I was always interested in this but felt it may not live up to the hype. But a 9/10 suggests may Switch indie collection is about to grow. @Billsama Haven't played Isaac, but if you haven't played Shovel Knight you should definitely get that first. This game is excellent, but Shovel Knight is a modern classic. Is this that sort of 9 like that one given to Fast RMX? Is this really that far more beautiful than King of Fighters '94? It's 77 at Game Rankings. @SwitchVogel Thanks! My thoughts exactly. I've played Shovel Knight on 3DS, but I can imagine it looks exponentially better on the Switch screen. EDIT: And if you already have Shovel Knight on 3DS, I would highly recommend getting Isaac first. You should get far more playtime out of that one, and it's a really good game. @Tetsuro Opinions and what not. Personally, I'd rate this at a 7.5-8ish. That said, for someone that is a SHMUP aficionado, it could easily be a 9 or 10. But why get so bent out of shape over a numberical opinion? So Mitch enjoyed this game 13% more than the average game ranking score. Is that so evil? The bottom line, regardless of its review score: It's really good. If you love arcade shooters, get it. If you're not one to chase high scores and you don't like arcade shooters, you should probably pass. @roadrunner343 Opinions certainly, but a review should be more than an opinion and if the others are saying 7, and 7 looks fair to a game like this. It's not about being 'good or evil' but trustable. 9 is a top game and frankly someone gave a 9 to that game named 'Isaac' but it looks ridicule too. Like Yooka can't be a 5. It's good? Ok, fair. Good like a 7 or Excellent like a 9? I think I'll pass, more because of the graphics that really don't attract me. The eye would like something better, it really seems so simple and unengaging. Asteroids was cool back in time (I'm talking about graphics), wouldn't have been the same with mediocre sprite graphics. @Tetsuro All reviews are opinions - there's no way to be fully objective. Sure, they should try - but saying this game is a 9 isn't completely out of line. I mean really - Is the difference between an 8 and a 9 really that big? Either way, both an 8 and a 9 indicate it's a great game. If high score chasing and arcade shooters are your thing, this could easily be a 9 for you. As for Isaac - saying it doesn't deserve a 9 because it looks "ridicule" is just plain ridiculous. The game is great - maybe an off putting theme/art style for some - but the game play is solid and is easily an 8.5/9, if that genre of games is your thing. For someone complaining about unfair opinions that wants trustworthy reviews, you sure are writing two games off extremely quick for never even having played them. As for not liking the graphic style? Again, a matter of opinion. You don't like it, and it was one of the things that drew me in (Simplicity, bright, colorful). Neither is right or wrong, but obviously there is quite a bit of opinion in anyone's review. @Billsama Yeah, I have mixed opinions on Isaac's price. On one hand, I feel it's extremely overpriced. I picked up rebirth on steam for like, $3 I think. But on the other, I've already put around 30 hours into it on switch, so I guess I can't complain. All in all, I've probably got around 100 hours between steam/switch, and I would imagine I'll get quite a bit more playtime out of the switch as well. @roadrunner343 If you ask to my teacher... yes, there is a big difference. 9 is excellent, 8 is good and 7 is fair. Is this really excellent? Splatoon, a game eventually better than this, got 81 by critics. Eventually rating on indies it's a bit over the top, and that King of Fighters '94 deserved more than a 6. A classic with no lows. Uhm I checked back, did they modified the score? It's actually a 7. It's good that they change scores afterwards to tweak it after a re-thinking. Well done NintendoLife this time. Could have been an 8 but it's less disturbing. The King of Fighters '99 is definitely far less good than '94, trust me, and it's been received at 75%. King of Fighters is excellence if we talk about beat'em up. Far better than Street Fighter in my opinion, even if I appreciate that too, it deserves the right judgment. Everything before '99 is good. @roadrunner343 Isaac is definitely off-putting but the gameplay is nothing extraordinary at all too. It's decent. Even with a decent setting would have not been that good. Technically is modest, graphically is ugly. Gameplay is decent and all this makes a game worthed 9? @Tetsuro Clearly there is a massive difference between a school/university assignment with a clearly defined set of requirements and deliverables. That is much less subjective than a video game review. The two aren't even remotely comparable. The point is - read the review. Get a feel for the game, what made the reviewer like it, what they didn't like, etc... that's far more important than some arbitrary number assigned to the game. The difference between an 8 and a 9 is not huge when looking at a single review, given that individuals opinion fluctuate so much. As for Isaac, I go back to my original question: Have you ever played it? Certainly the graphics/theme can be off putting at first - it's the sole reason I passed up the game for so long. The gameplay isn't revolutionary, sure - but it has been refined and pulls everything together in such a way that the gameplay loop is nearly perfect. Just like everything else, if you hate twin-stick shooters, obviously your opinion of the game will be lower. @Tetsuro And you keep using aggregate scores as if they're somehow the gospel. Nintendo Life ranked this game higher than Gamerankings, so that harms their credibility you say. Using your own logic, because you don't like Isaac, and it currently sites at 91 on Gamerankings, I guess that makes your opinion of the game completely invalid, and really harms your credibility... right? Because everyone's opinion should line up with Metacritic/Gamerankings. @roadrunner343 Look, I'm not against this game at all. But a Rez was a similar shooter too, with great graphics, an excellent soundtrack, a gameplay really that solid and got 81%. I suppose this isn't any better. And I truly appreciated Rez but I would have criticized NintendoLife for giving a 9 to that too (8 would have been fair, because it's definitely good). I like Nintendolife, heh. I keep coming every day here, though reviews are somewhat an hit and miss. No I don't give out opinions only on games I play roadrunner. Though I watched a 40 minutes run, saw multiple levels, made an opinion, and definitely I'm not considering its purchase. I didn't tell gameplay is bad, I saw it decent, definitely. A decent arcade. Not something to make me blindfold my eyes and ignore the technical aspect that's just bad. A 9 it's reserved for an excellent game, this means everything should at least work out, and graphically it's just bad. Not decent, bad. Game Rankings it's good to get an idea but it's not The Bible. It works many times. Eventually reviewers saw cool the splatter setting that's an actual trend, but I'm old, I'm 37 and american splatters make me just roll eyes. It's like comparing Billy & Mandy with The Simpsons. The latter actually deserves a 9, the first while engaging isn't up there. Isn't it? So you actually think Isaac is up there with Splatoon, Mario Kart, etc.? Is that perfect as a package? I do see so much downs on that game. @Tetsuro You're just further proving my point. You can't reference gamerankings to prove your point when it suits, and criticize Mitch's opinion for differing, while also doing the same thing yourself by disliking Isaac when the rest of the critics rank it very highly. My point from the very beginning was that opinions differ, aggregate scores aren't everything, and a 9 is a perfectly valid score for this game if you are a SHMUP fan or high score chaser. I would give it an 8 myself, but that doesn't invalidate this review. As for Isaac, why does it matter how I think it compares to those games? Everyone's opinion is different. I didn't find Splatoon to be all that amazing. Good not great. MK8 was outstanding. Even so, I've played Isaac more than both of those. Obviously opinions differ greatly for all games, especially when you try comparing games across completely unrelated genres. @roadrunner343 But GameRanking IS a good reference. If reviewers get wowed on one game it's not that all other game reviews are bad. It just register a tendency. It happens sometimes that some games are overvalued or undervalued, it happens on any system. poop happens every time. I'm here surprised about this 9, and suggesting eventually wait some days of playing before rushing a vote. It's money, you know. Liking a game isn't reviewing it. I can understand you like it. But judging from above can you give a 9 considering everything? It's a review, not a "hey it's cool I'm having fun with it". @Tetsuro And my point is you can't simultaneously use it to prove a point and then disregard it when you feel like it. Would I say this game is a 9? No. I've already stated I would give it an 8. It's a really good game. But I can easily understand how a huge SHMUPS fan would give it a 9. As for Isaac, I absolutely would give it a 9. So have many other critics. You obviously disagree. That's fine! That's the whole point. Everyone is different. Every critic is different. One high score is not a problem. Read the text of the review and make an educated decision. Seems most users agree too - GEM currently sits at 8.9 in user scores on metacritic, so obviously some people love this game more than others. @roadrunner343 You say 8, I say 7. It's pretty there. 9 is not. Poor Splatoon and all the quality games that people actually fatigue developing and don't get to the top. While american mediocrities gets the 'yays'. @Tetsuro Not sure what nationality has to do with anything. Splatoon was extremely well received - no one is going to say it was a bad game. So who cares what the metacritic/gamerankings score is? Use it as a guide to inform your decision, nothing more. You're the outlier on Isaac - pretty much everyone loved the game. You don't have to be a fan of the art style, but to critique Mitch's opinion for differing from the norm (13% higher than the average) while simultaneously writing off a game that is universally praised (Around 90's most places) is nothing short of hypocritical. I don't care if you hate Isaac - that's perfectly fine. But then don't act like someone else can't have a drastically different opinion of a game. Nevermind the fact that you've not even played it. With that, at least we can agree we've thoroughly derailed this topic, so I'll take my leave. Coelho sells much, it's rated high. It's actually that good? Is it a Cervantes, a Baudelaire, a Voltaire, etc.? I'm proud to be the outlier in this case. I don't hate games, eventually I can pity them but hating not really. I didn't said its gameplay is bad, I said it's decent. Decent means hating? Well... the whole package isn't up with the crop, that's it. I'm currently working on the fourth (last?) world. So far, I haven't had this much fun with any other single-player game I've played on Switch. At most I'd like to see a survival challenge (unless there already is one), a faster way to restart a stage and an option to rebind buttons. All too often I've turned around when I meant to panic escape (because I've bound bombs in various danmaku to the left bumper). @Pahvi I'm with you - it's sunk it's hooks into me much deeper than I expexted. I've only completed 2 worlds so far, because the hi-score chase has got me good... I'm currently rank 2 on the Magentos Prime score attack challenge (I'm Luke). It reminds me of Pac-Man CE DX in that way. This game is an excellent value. Looks like a fun game and I always like a little shooter to play at work during my break so I'm going to download this right now. Nah, I don't care much for bland, technique-based, high score chasing shooters. Anyway, I have some problems (mostly audio/visual) and wishes (such as a handful of short 1-2 min. levels and the ability to save and upload scores later, both for traveling, etc. purposes). However, GEM is an extremely addicting little game and definitely fulfills a sorely needed niche by giving us high score hounds a reason to drip sweat on our Switch.